The Bundesliga will be even more colourful than usual this weekend after the league voted to allow clubs to paint their pitches in the hue of their choice for one matchday each year. Have you updated your Official Fantasy Bundesliga team yet? Click here to do so now! The unusual ruling only came to light in recent days but groundsmen around Germany are thought to have been carefully spray painting playing surfaces over the international break. 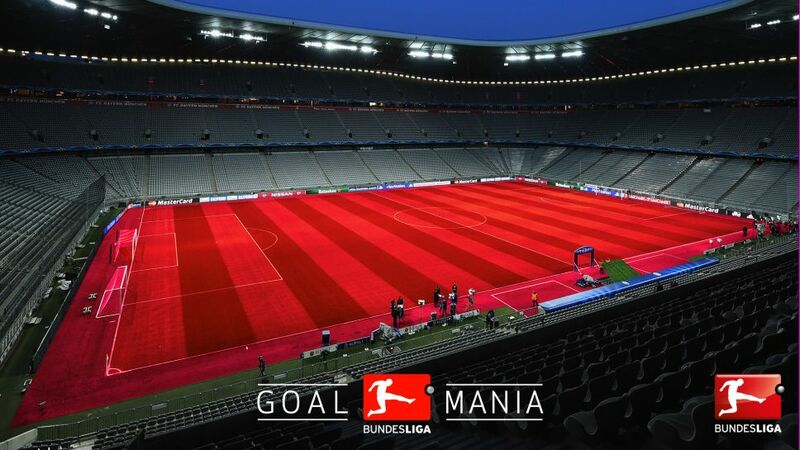 Bayern Munich have painted the Allianz Arena’s hallowed turf red for the visit of Augsburg, meaning that Carlo Ancelotti’s home side must now wear their away strip of black to ensure that his players can see their own team mates. Schalke and Borussia Dortmund decided to make a joint effort ahead of the 90th Revierderby in the Bundesliga's history. But since the mix of their colours - blue and yellow - is green, the Veltins Arena will be one of the only grounds not to feature strangely-coloured grass this weekend. The other exception was for the Hertha Berlin-Hoffenheim game on Friday night since both clubs could not agree on which shade of blue paint to use. Freiburg have wisely chosen to colour their pitch red rather than black so they will now wear their second strip of white. As Werder Bremen are set to wear green though, spectators with colour blindness have been advised to bring a friend. Eintracht Frankfurt’s decision to paint their pitch in black and white stripes ahead of the visit of Borussia Mönchengladbach is another change that could confuse viewers and match officials alike. Meanwhile, Hamburg have gone for a white pitch to match their home strip so orange balls not seen since the depths of winter will have to be used for their game against Cologne.